Anxiety affects every one of us. Anxiety is defined as a feeling of worry, nervousness, or unease, typically about an imminent event or something with an uncertain outcome. Anxiety does have an important role to play, to help us navigate through hard decisions and determine risk; those are times when anxiety is necessary. Your brain helps you weigh the odds and make the best judgement, but when your brain can’t stop focusing on all the possible negative outcomes it becomes an anxiety disorder. Anxiety disorders affect 5% of Canada’s household population, but those numbers could be considerably higher because almost half (49%) of those who believe they have suffered from depression or anxiety have never sought medical help. Anxiety displays differently in each person. Depending on the form of anxiety common symptoms include chest pain, headaches, numbness and tingling, dizziness, nausea, fear of impending doom, shortness of breath, and so many more. Because anxiety can rear its ugly head in so many ways it can go undiagnosed and untreated. Anxiety disorders are associated with a ten fold increase in suicide risk. There are six recognized anxiety disorders: generalized anxiety disorder (GAD), panic disorder/agoraphobia (PD/A), post traumatic stress disorder (PTSD), social anxiety disorder, obsessive compulsive disorder (OCD), and specific phobia. The thing about anxiety is you can worry about the past – would’a, should’a, could’a’s or you can worry about the uncertainty of the future, but it’s really hard to worry about the right now. The more you become aware of, and live in the present the harder it is to be anxious about anything. This is why mindfulness practices are so effective and valuable to those battling anxiety disorders. Floating in a dense Epsom salt solution has proven very effective for treating anxiety. One study conducted in in Sweden included 32 participants floating over a 6 week period. At the end of the study the participants experienced lowered blood pressure, reduced pain, anxiety, depression, stress and negative affectivity, as well as increased optimism, energy and positive affectivity (Department of Psychology, Karlstad University, Sweden. 2005). Today Justin Feinstein Ph.D, a scientist at the Laureate Institute for Brain Research (L.I.B.R.) 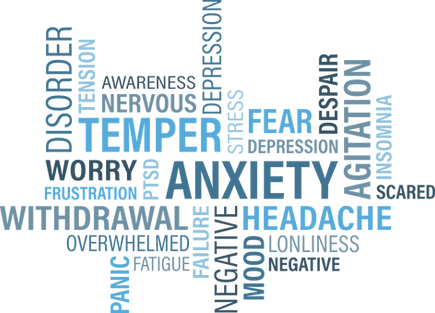 in Tulsa, Oklahoma is conducting the most up to date and exciting research on float therapy and it’s effects on anxiety, addictions, and anorexia. Justin Feinstein released preliminary results from his research at the 2016 Float Conference. In these studies, the participants reported a significant increase in the feeling of serenity, and a significant drop in anxiety post float. I repeat, significant. 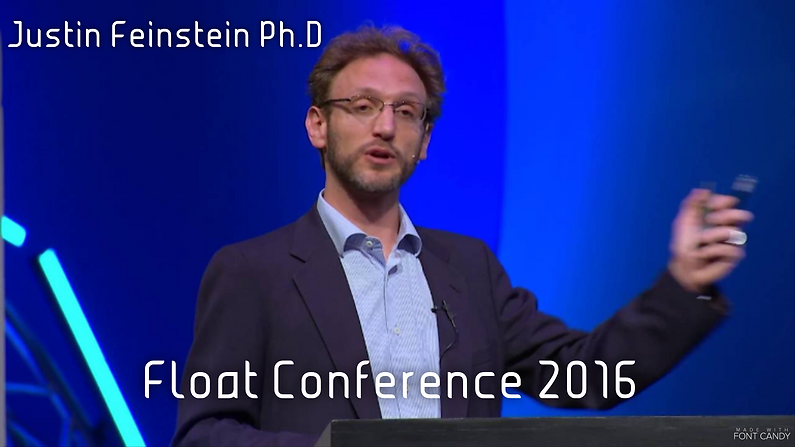 Each year Justin Feinstein’s talk at the Float Conference is one the of most attended, and anticipated lectures. It’s a 45 minute time investment, but if this topic is of interest, or applicable to you, I highly recommend watching his talk (click on picture below). Justin is an exciting speaker and offers dense scientific research in easy to follow, and understandable way. No one knows the power of float therapy better than Michael Harding, a former solider in the Australian army. After being discharged with PTSD Michael’s life was in a deep spiral, turning to alcohol just to numb the pain enough to sleep. He suffered from full body muscular twitches so bad he couldn’t drink water without spilling. Conventional treatments provided little relief. With no where else to turn his partner, Bek started researching alternative therapies for PTSD which led to discovering floatation. 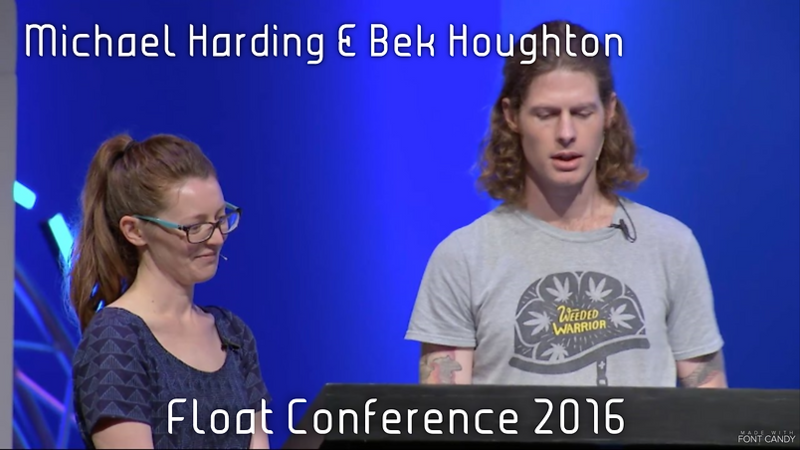 Michael and Bek spoke about their recovery at the 2016 Float Conference and left the crowd absolutely touched by their story. Michael and Bek started the Weeded Warrior project to help vets and their families discover safe and healthy modalities to treat and deal with the challenges associated with PTSD. Click on the picture below for the full talk; it’s less than 10 minutes, or you can read about his journey in this TIME article. Anxiety is in all of us, and in this technological age, incidents of life altering and debilitating anxiety disorders is only rising. Float therapy helps to mitigate these risks and enjoy life to the fullest. After all what do you have to lose? Other than stress and anxiety?